Four students from the Glasgow School for Business and Society (GSBS) at Glasgow Caledonian University, have been studying Ideas for Ears. 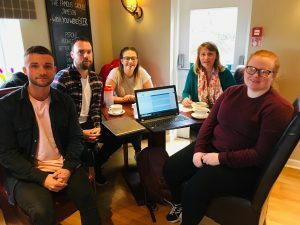 Calum MacNeil, Jill Turner, Niamh Ward and James Roderickson selected our cracking wee organisation as a case study that they could investigate as part of their coursework. The final year students were tasked carried out the assignment to help them learn more about a social enterprise, the leadership of it, and how businesses with social purpose are making a difference to society. Their exploration was part of a wider global learning initiative for students called AIM2Flourish, which is an UN-supported global learning initiative where students learn how ‘innovation for good’ can support Scotland to meet the United Nation’s Sustainable Development Goals.